I am pretty sure I have always loved cornbread. I know it can be tricky. We have all had super dry, crumbly, and ones that tasted stale. There are burnt bottoms, flavorless and even ones that seem to explode in your hands as you grab a piece. But like all good stories, there can be redemption, and I think I have found it. 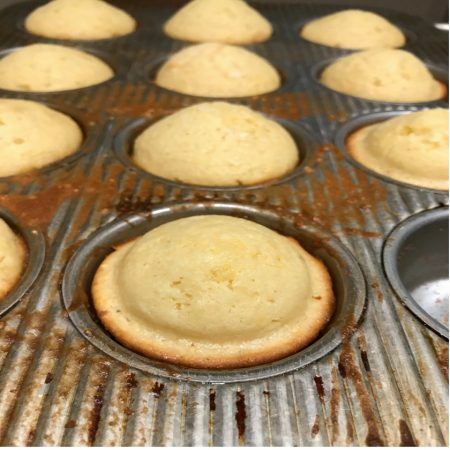 I have made the following cornbread in a cast iron skillet (fun and awesome) and also made them as muffins. I have added additional corn kernels and left them out. They ALL are great. Maybe I just like em sweet. There is definitely a little more sugar in this one, but let me tell you, they are a perfectly moist accompaniment to your favorite chili or as I did this past weekend, gumbo. Preheat oven to 350. Spray your muffin tins. Mix all (don’t over-mix) and pour into muffin tins, about 2/3 full. Bake fore 18 minutes. Makes about 18.